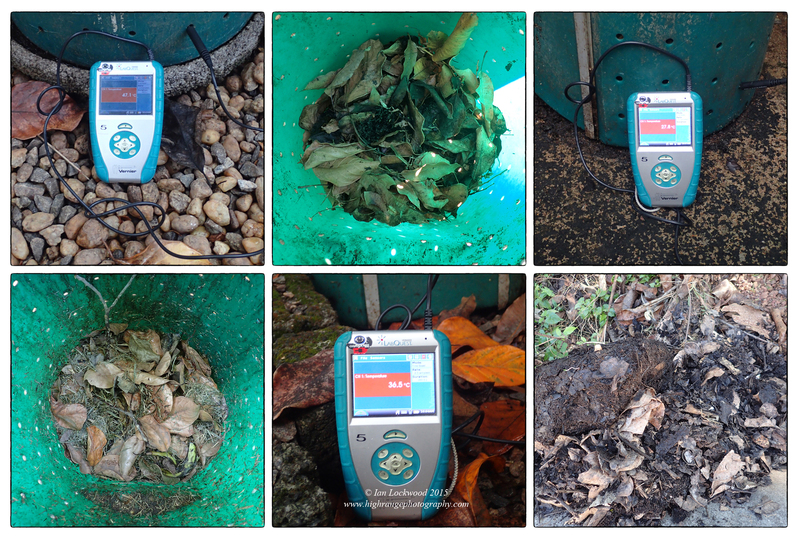 Compost at three stages in our garden. The Vernier Labquest shows the temperature of each bin. The active bin and temperature is on the left with a temperature of 47.1 C showing healthy levels of metabolic activity. One of my struggles as a human being living in a 21st Century industrial, consumer-driven society is how to better live up to the ideals that are imbedded in the concepts that are a part of the course content that I teach. The IBDP Environmental Systems & Societies course promotes ideas of sustainability (defined roughly as the extent to which natural income is utilized without affecting the natural capital of a system). IBDP Geography also looks at sustainability but spend time on populations, resources and the broad concept of carrying capacity. In the IBDP Creativity Action & Service (CAS) course outline the issue of “considering ethical implications” of one’s actions are highlighted in the eight IB learning outcomes. One contemporary environmental challenge that I have made efforts to address since my days as an undergraduate student is the issue of solid waste. I see our home as a virtual laboratory to test just how much we can cut back and reduce our family’s ecological footprint. In this post I’ll review the recycling and solid waste situation at three different scales here in Sri Lanka. Colombo faces significant solid waste challenges as it experiences rapid growth in the post conflict years. The problem is not so much one of human numbers but of human lifestyles with per capita consumption and solid waste generation going up. Local newspapers (see References below) highlight problems with disposal, tension in communities stuck with city waste and controversial plans to incinerate waste. Approaches to recycling have changes during the last 10 years that we have been living in Colombo. In 2006-7 the Colombo Municipal Council set up several eco-kiosks for consumers to drop off recyclables at. It was a nice idea, but from my observations and interactions, the eco-kiosks had a mixed rate of success. Some discerning citizens used them regularly and deposited loads of cleaned recyclable materials. However others treated them as places to toss unsorted waste. Without proper supervision, the two eco-kiosks in our area (Talawathagoda and Battaramulla) became foul-smelling, cluttered sites that few people wanted to use. They were closed down two years ago. Most households now rely on a municipal neighborhood solid waste collection service that comes by with a tractor and trailer every week. Households are requested to sort their waste into two broad categories (organic and non-biodegradable items). 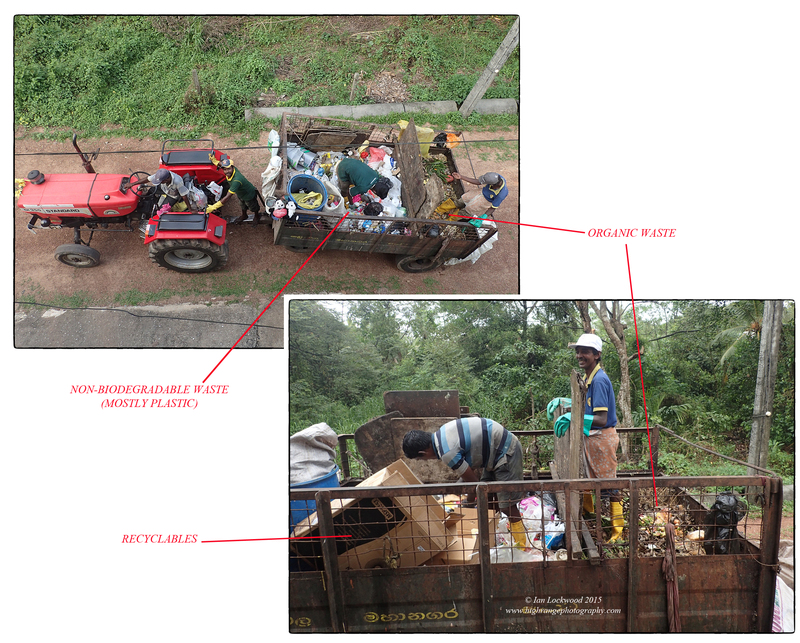 The municipal workers sort the waste into organic and non-biodegradable sections (see image above). Their tools are basic and they endure unsavory working conditions. Unfortunately these hard working teams are unrecognized for the key role that they play in the city’s environment. The waste is carted off to one of several sites where it might be further sorted and then is basically left to rot, with some of it being burnt. 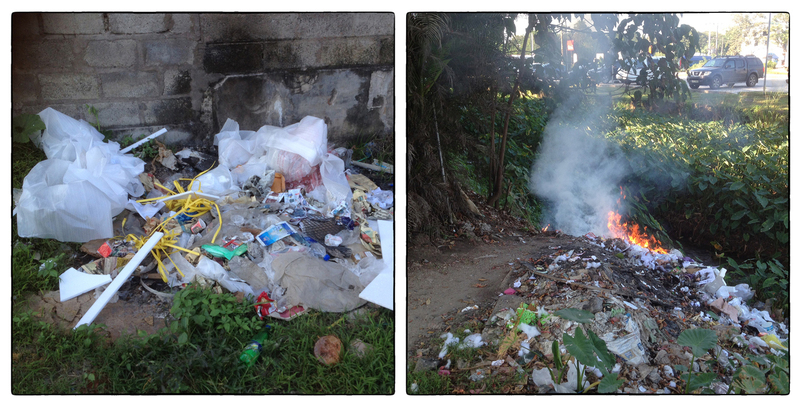 It is this reality that has been the subject of concern amongst citizens and environmentalists in the city. Haphazard solid waste disposal and burning behind a major grocery store chain in the Pelawatte/Thalawathgoda neighborhood. The practice of burning waste, which often includes significant amounts of plastic and other synthetic materials, is widespread. For a variety of reasons there is a high prevalence of small-scale waste burning in Colombo’s residential neighborhoods. Traditionally people must have lit small fires of leaf litter and other collected waste that is swept up at the end of the day. In our area (that falls under the Battaramulla municipality) many neighbors continue to burn mixed waste. One neighbor suggested that the burning is timed to suppress mosquitos. The problem is that now household produce a good deal of waste that is synthetic and this gets thrown on to these same fires. There are few days that we don’t pass by a fire with burning plastic, PVC, styrofoam and any number of other items. This obviously has serious health consequences. 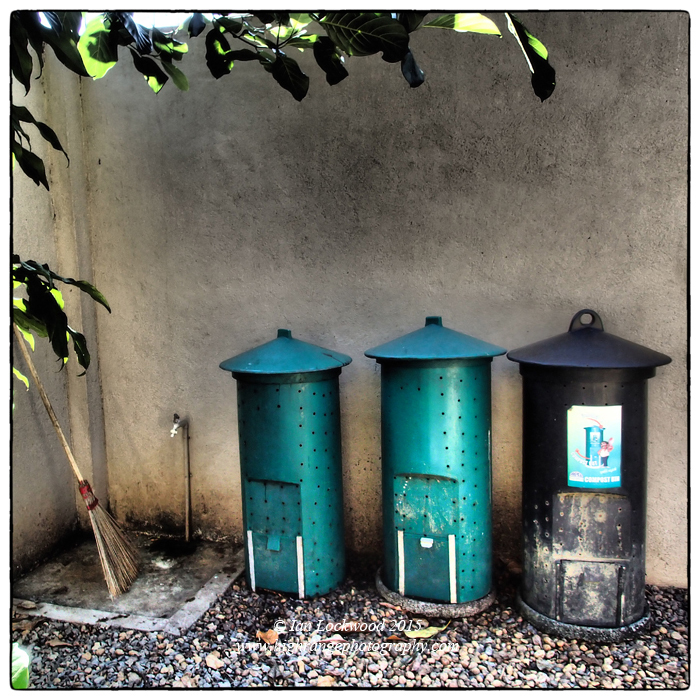 How domestic solid waste is collected from our home in Pelawatte, Sri Lanka. OSC with its 500 + students, teachers, administrators and support staff produces a significant amount of solid waste that is collected by the Battaramulla municipal council teams. There is some sorting at the cafeteria where wet waste is partially separated from all other kinds. The OSC Recycling and Sustainability (R&S) project has a mission to reduce the volume of solid waste and raise awareness about environmental and sustainability issues on campus. The group has a stated goal of reducing the school’s ecological footprint. 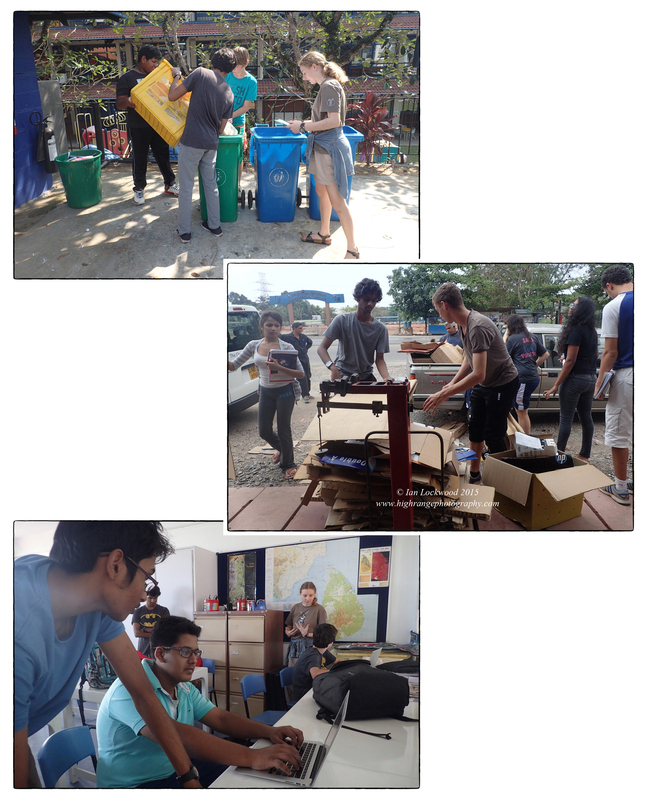 Its weekly activity consists of collecting recyclables from classrooms and offices. The recyclables are sorted and the data is recorded with the idea of studying long-term trends to see if the efforts to reduce are having any impact. The group also works on projects with the canteen and administration to reduce waste at source and promote energy conservation. Over the years we have had several notable and energetic student leaders including Olivia Molden, Yi Suel Shin, Yulia Alex Mylvaganam, Satyanshu Sapra, Jennifer Anderson, Constance Klemplin, Yoon Jae Hwang, Nishant Matthews and several others. See the blog link here and below to get a sense of what the group has done in the last five years (the blog was started in 2010-11). Environmental issues also figure in course content in all three IB programs. The Primary School is very good about raising awareness about issues and the Middle Years Program (MYP) does studies on energy and ecological footprints. In the Diploma Program the Geography class uses the issue of solid waste and recycling to run field studies and surveys. This is shared with the wider OSC community through the weekly newsletter and R&S blog. OSC recycling in action (from the top): Students in the Thursday afternoon R&S service activity collect and sort paper, cardboard and other materials outside the recycling room near the gym. DP Geography students weigh and sell cardboard to our main scrap dealer buyer who will resell it for recycling in India. DP R&S student leaders Nisala, Nandini and Nishant work with younger students on a reflection at the end of the Thursday service session. Data about patterns in consumption and recycling is gathered and analyzed as a key part of this activity. It must have been was growing up in Bangladesh where I learnt that there is no such thing as garbage; only resources. Nothing went to waste in Dhaka, from empty beer cans, to office paper and even plastic bags: all had real economic value that was obvious to most consumers. The key to Dhaka’s successful recycling had little to do with any government planning or fancy development plans. Instead an army of informal workers, each with their own basket and weigh scales, competed to buy, collect and sell whatever they could. Houses in the wealthy neighborhoods of Gulshan and Baridhara were lucrative areas to trawl. High-income lifestyles, especially amongst the foreign community, were relatively wasteful and generated large volumes of perfectly useful materials that could be resold for a decent amount. Extreme poverty helped drive some of this recycling dynamism but the resilience and work ethic of the families collecting and sorting through the materials (often in hazardous conditions) played a key role. Their efforts helped to significantly reduce the need for landfill space, incinerators or other methods traditionally resorted to in industrial societies. Three stages of compost at home. The bins are made by Arpico and also marketed/promoted by the Sri Lanka Central Environment Authority (CEA). Living in Pune I was exposed to ideas of composting and vermiculture. Ever since, our family has successfully been able to completely manage all of our own wet organic waste. Here in Colombo we have three bins that have waste being cycled through them. Because of the warm, humid temperatures in Colombo we can recycle most organic waste through the system relatively quickly. It takes about 3 months between the time that a bin is started and then emptied out into the garden. The opening set of pictures shows the temperatures of the three bins. Temperatures are high (@40-41 C°) in the active bin where metabolic activity is high. Then, as the compost breaks down, the temperature drops back down to normal air temperature (26-32 C°) as different organisms works to break down the waste. I’ve learnt to mix an equal amount of leaf litter/grass cutting with food waste in the bins. Any meat waste is kept out and feeds neighborhood dogs and monitor lizards. The plastic of the Arpcio compost containers is hardy and keeps most rodents at bay. I regularly roll the bins on the ground to aerate the compost. I also add a little water to the non-active bins to keep them moist and conducive for decomposers. 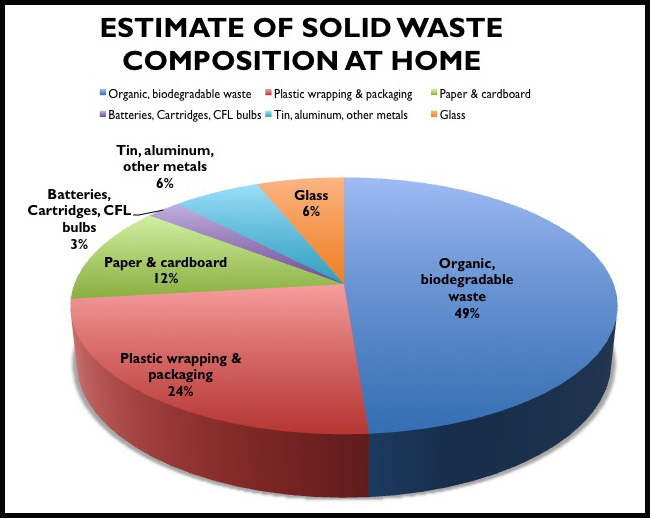 This is a rough estimate and breakdown of our household waste in terms of composition and weight (see table below). In Colombo we generate, what I would assume is, an average amount of solid waste, but based on my research we put out far less garbage than other similar families. Unlike many other houses in the area, our waste (mostly plastic packaging) is not mixed with rotting food (a source of unsanitary conditions and an invitation for stray dogs that like to open bags of mixed waste). Through a combination of active recycling and composting I believe that our household has been able to make major solid waste reductions. At the school and certainly at the city level there is still a great deal more that needs to be done. The issue of dealing with solid waste in a scientific and ecological manner is quite straightforward, while the bigger challenges of the country developing into a resource-consuming society looms with uncertain consequences. Berenger, Leon. “Garbage Crisis growing by the day.” Sunday Times. 22 March 2009. Web. 23 March 2014. Dissanayake, Chathuri. “Garbage collection waste deep in management and disposal.” Sunday Times. 15 September 2013. Web. Ratnayake, Niranjanie. “Issues related to solid waste management in Sri Lanka.” The Daily News. 16 July 2012. Web. 23 March 2014. Wipulasena, Aanya. “Waste rots, want lots.” Sunday Times. Web.